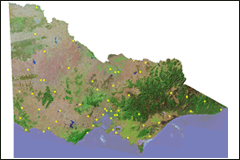 Victoria has a moderate climate, generally favourable to plant growth. Climatic variability is influenced by both topographic features and seasonal weather patterns. Internet-based Agricultural Warnings (IBAW) are calculated daily by DPI Victoria from 7-day digital forecasts provided by the Bureau of Meteorology (BoM), and give advanced warning of weather events likely to affect agricultural production. Close to an extreme event or in emergency situations please consult the official BoM warnings, which are issued 24 to 36 hours prior to extreme events. A landscape visualisation of the National Adaptation and Mitigation Initiative (NAMI) at Longerenong. This page describes Victoria's Climate, Seasonal Variations and the El Nino influence. This page describes Victoria's Rainfall distribution, seasonal variations and topographic effects. Links are provided to Bureau of Meteorology Rainfall maps. This page describes Victoria's Temperature variability and frost conditions. Links are also provided to Bureau of Meteorology Temperature maps. The Primary Industries Climate Challenges Centre (PICCC) is a collaborative venture between the University of Melbourne and the Department of Primary Industries Victoria. CSIRO Division of Atmospheric Research (external link) provides scientific advice and solutions on issues involving the atmospheric environment and the climatic systems. Information on the site covers topics such as the Greenhouse Effect, Ozone Depletion, El Nino and La Nina, urban and regional air pollution. The aim of the Australian Water Availability Project (AWAP) is to monitor the state and trend of the terrestrial water balance of the Australian continent, using model-data fusion methods to combine both measurements and modelling. 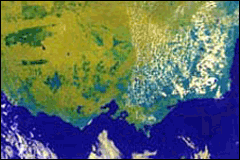 The Bureau of Meteorology website provides overview climate maps of Australia, including climate zones, evapotranspiration, sunshine hours, relative humidity and thunder days. The Water and the Land section provides an integrated suite of climate information for primary industry and natural resource management including rainfall forecasts, infrared satellite images, temperature, wind, pressure, humidity, evaporation, sunshine and El Nino and La Nina information. The Long Paddock contains Australia-wide information on the Southern Oscillation Index (SOI), future rainfall probability, and historical rainfall records. The Climate Variability in Agriculture Program is a national program working with the Australian agricultural sector to develop and implement profitable and sustainable management strategies which prepare it to respond to the major opportunities and risks arising from climate variability. The website provides fact sheets related to climate prediction and Impacts as well as downloadable newsletters. 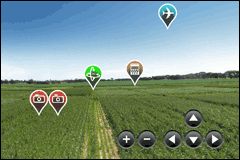 Climate Kelpie is a one-stop shop for climate info for farmers, including decision support tools, plus links to many other climate resources and farmer case studies. All content is categorised and searchable by location, topic, and commodity.